As some of will have noticed on Jo's blog, I had an annual event yesterday :-) I have to say it was up there with the best too. Jo popped down at morning coffee time with a bag full off goodies and I feel the need to share a couple of them with you cos I was so blown away by them. This was the birthday card she made for me. 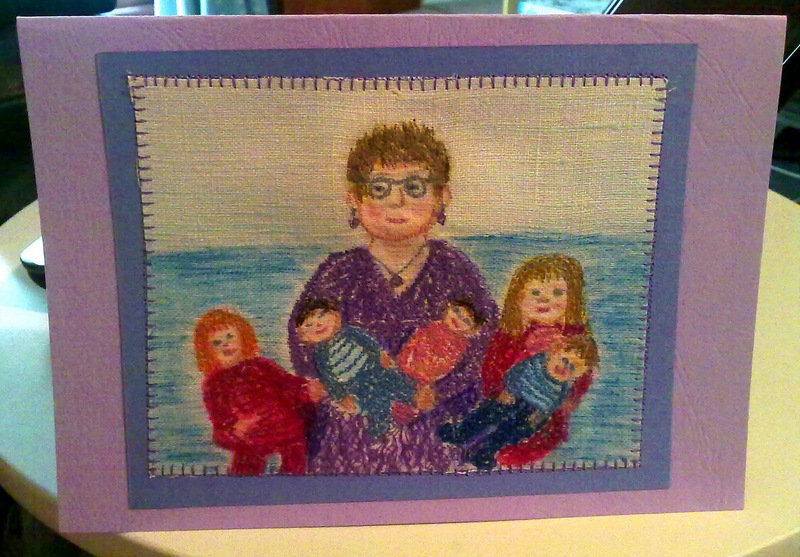 It's all machine embroidered and of course is meant to be me with my, now, 5 little grandchildren. I love it. Isn't she just so clever? This is the other pic that I want to share with you. It's well worth clicking on it to enlarge it cor a closer look. 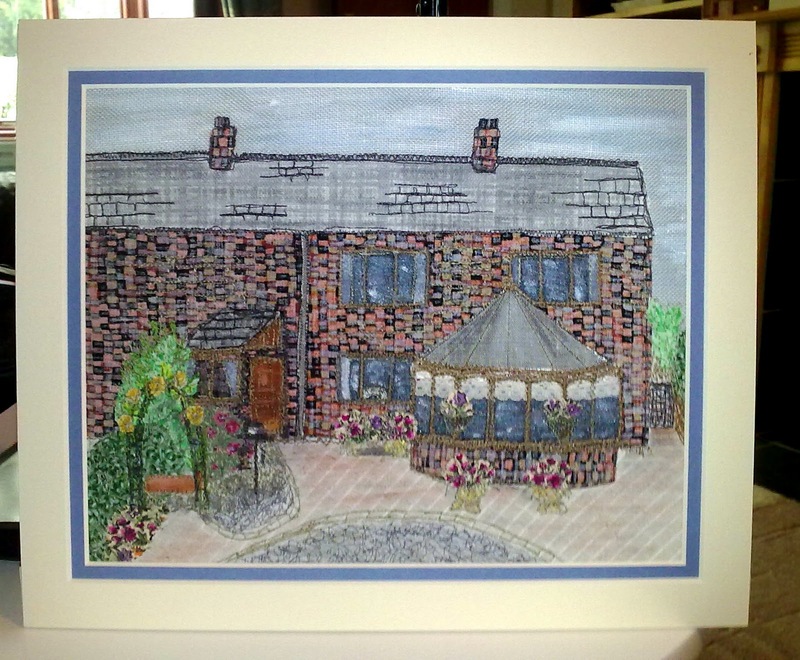 She has done us one of her amazing collage pics of the front of our house. She has chosen the fabrics to perfection and done a truly amazing job of it. There is just no doubt of where it is a pic of and it will be framed up to take pride of place in our home. Thank you so much Jo. You really are so talented. If anyone wants one of their home then do let her know. The only thing I ever really ask for on my birthday is to get all my family together and we have often all gone out for a meal but as you can imagine it's not so easy with 3 new little family members so this year I decided to celebrate by having everyone here for a buffet tea. It's my son Mark's birthday on 25th too so we always have a party at some point. Hello. What a lovely, lovely post. I recognised your house immediately - what great pieces of work. Love all your family photos. Oh, how wonderful to all be together! Such a lovely family. That would be my dearest wish to have them all together but at least I've got the German contingent coming in a couple of weeks. Happy Birthday Annie and, in the old fashioned way, I'll wish you many happy returns of the day! Big AW! Beautiful array of Grandchildren there and nice to see who I "converse" with! Oh WOW! Jo's art is just fabulous! What a talented pair you both are! Love your super happy cheery post! Sure sounds like you had the most super of birthdays! Beautiful photos too! Those babies are growing so quickly; I think the twins are trying to catch up with their cousin Steve! Have a super week Annie! What a fab set of pics - those gorgeous children are just perfect - what a lucky nanny Annie!! Looks like you shared a special birthday with your special little'uns! Happy Birthday. There’s no doubt about it, Jo is just so talented and what wonderfully personal keepsakes you now have. Loving the beautiful family photos too. I hope ‘M’ is still making progress and almost back to her old self. What a proud grandmother you are with all your lovely grandchildren there. Adorable!!! 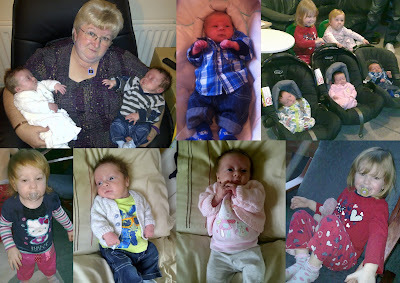 grandmother with all the five grandchildren.